Project Process | construction of a new, single floor elementary wing and modernization of the entire school over two separate phases. We have provided and will continue to provide opportunities for student, staff, parent and community input. Stage 1 Plan and schematic design are complete, including several public and staff consultation sessions. Detailed architectural drawings are also complete with the tender awarded to Westridge Construction of Regina. Construction on the change rooms started in June and is being delivered by G. Hahn Construction of Fort Qu’Appelle. The main portion of the Phase 1 addition construction will begin in August. Phase 1 consists of a new, single storey elementary wing addition and change room renovation plus various life safety systems improvements. Phase 1 will be complete by July 2012 with one of the final tasks being the demolition of the current elementary wing. Phase 2 work involves an addition for a student servery and common space near the gym and renovation of the high school wings; detailed planning will begin later this year. 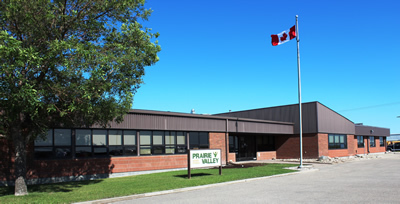 Estimated cost is 7.3M in total, with 100% of the cost is to be paid by Prairie Valley School Division. Ministry funding was requested but declined. The proposed plan does not include a stage or expansion of the gym floor area to allow seating, due to the cost ($1M incremental), but this is an option for future.